It’s so fun to CASE your fellow designers! I regularly ooh and ahh over what my fellow Bloomie’s create, and this gives me permission to try something they’ve put together, and then put my own spin on it. It’s such a fun month ahead with this challenge! 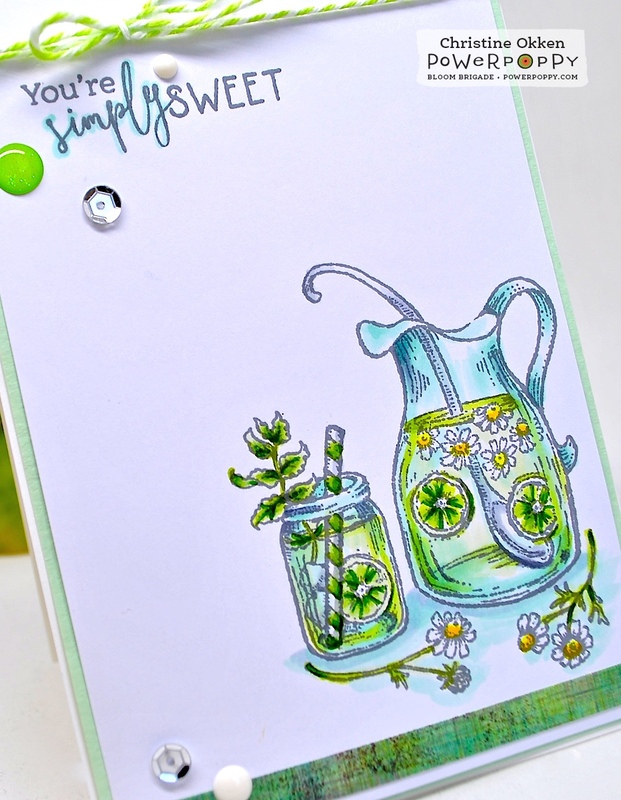 How about some summery Limeade? I decided to start with CASEing a fabulous card by Cindy Lawrence, that makes me smile. It’s created with Power Poppy’s sweet set, Tea in the Garden. I chose it because I have yet to meet a lime I didn’t like :) both in colour and in flavour! In fact, I’m sipping on some water with lime right now to cool off on this hot summer day. I loved Cindy’s design (below), but changed a few things as well. 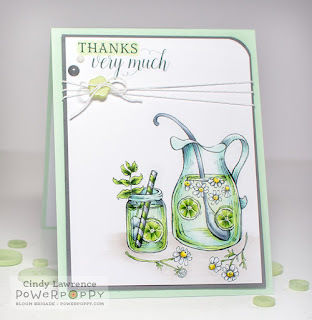 I stamped in grey ink to soften it up a bit, decided to make it more of a narrow card (3 3/4) to really play up the height of the pitcher, spoon and straw. Isn’t it interesting that just by doing that, it changes the look of the pitcher and mason jar and makes them look taller and thinner? I also framed it up a bit differently with rounded edges on the top, some patterned paper, changing the orientation of the twine, and the sentiment. Otherwise, it’s very similar, and how can you go wrong with a fabulous card like this one! 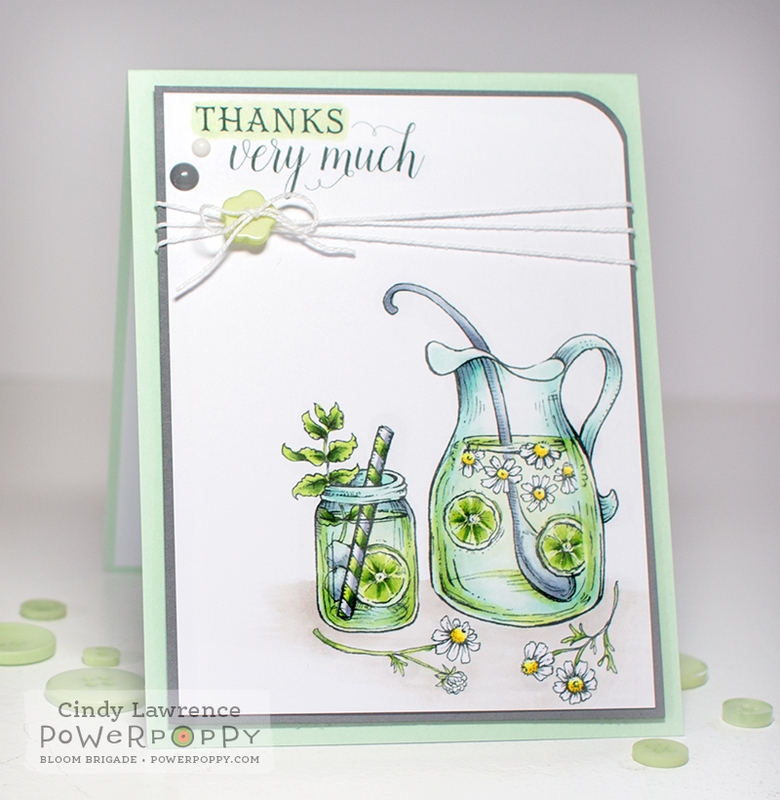 The sentiment is from Power Poppy’s set Simply Camelias. It has such a pretty scripty combination font doesn’t it? I added a bit of Baker’s Twine, enamel dots, and sequins. 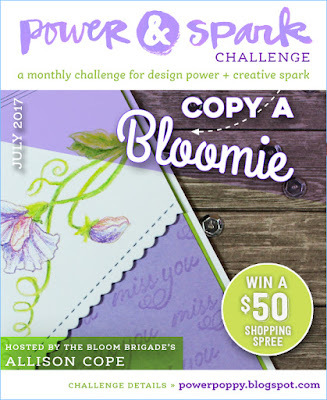 So, go find a sweet design of one of the Bloomies you’d like to CASE, and jump in, the challenge lasts all month and you could win a $50 gift certificate to the Power Poppy store! Before you go....how about some SALE news? Since Marcy decided to hit the road on a fun-filled family vacation, Power Poppy hopes you get... SHOPPY! See what I did there? Anywhoo, if you need to stock up on some digital stamps, NOW IS THE TIME! All digital images, ALL OF THEM, will be on sale through July 17th when you shop and use promo code VACATIONDIGIS at the time of checkout. How fun is that? 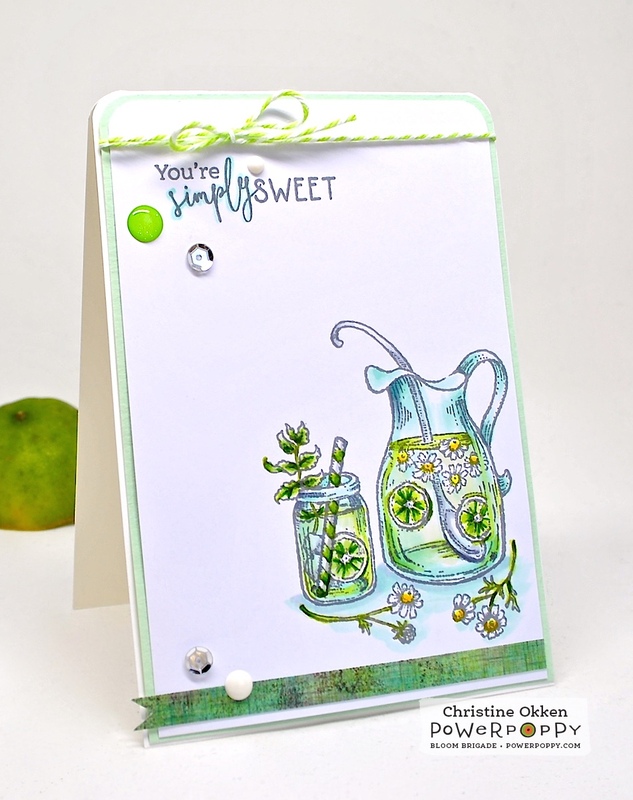 Christine, I truly like what you did with the lime stamping and lime coloring in this card. It is delightful--as refreshing as the drink! TFS. So beautiful and refreshing! All the Bloomies are CASEworthy, including you. Such inspiration! I love the lime in this. So cute! Love this! Looks soooo cool, especially here in Georgia with our hot days and high humidity this summer! Thank you. Your coloring is truly beautiful. Oh, Christine, I agree with Leslie that you are all to CASE-worthy, and I love your delicious cool drink! Beautifully colored, and I love the taller more slender card for a change. Beautifully done! Hugs!